"Cotton for everyone - Everyone for cotton"
After many years of experimentation, FAM WEST tents are now made of cotton fabrics, which in our experience hold up best in summer and winter camps, and which are good value for the money. We are continuously gathering feedback at events throughout Europe and keep in touch with our clients. The selection of fabrics as well as the construction of individual tents are the result of long development. This tent cloth is especially appropriate for summer camps since the tents are light enough to be set up by the boys and girls themselves. (Anyone who has set up a 6m tepee or a medium sized medieval pavillion made of thick cloth knows what I'm talking about!) In addition, the tents of this cloth are lighter to store and to transport. With good care these tents can last up to 10 summers. Last but not least, the price of this cloth is very attractive. A resistant cloth, scuff and tear proof. This cloth is recommended for tent camps which remain up from spring to late fall. Because of its strength it is especially water and wind resistant and perfectly designed for long-term use. For those who are relying on the long-lasting durability of the cloth, and who want cotton, this 360 gr/m² is just the right thing!! Nothing for the fundamentalists who won't tolerate synthetics in their tent. But an absolute must for those who have their tents up all year round and who want to enjoy the wonderful atmosphere of the tent in winter as well. As far as life span and characteristics of the materials are concerned - there are no compromises here and you don't notice 'abnormal' material. Extremely tightly woven and well waterproofed, this material holds up to the worst storms, downpours, frost or heat like no other. If you are planning a tepee village or medieval camp which is to be permanent, there's no way around this material. Especially suitable for year-round use and winter camping. Not only the material of the tent is decisive in its durability, but rather the way it is handled. 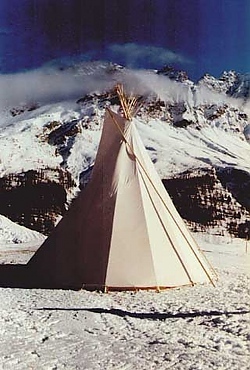 Even the word tent is a little misleading in connection with our products today. The Indians' tents as well as the medieval pavillions were much more than just a sheltered place to sleep for their inhabitants. They were the living-, dining- and workrooms all at once, as well as the school, town hall and the church. They were a place for living. These mobile habitations of the past were treated accordingly. A tent was worth a lot and its proud owners cared for it well, just as no one lets his house deteriorate today. The Indians believed that the round shape of the home had a special power in it and that since they gave up that way of life, this power has disappeared, because "there is no power in square houses". Our tents have a soul and each should be taken care of or it will be ruined.